Thanks for creating such a great stuff. I am not much techie, i want to use horizontal and vertical timelines. In this case both are not working in autoplay mode, have made separate JS from original and have changed ids also but autoplay function is not working for both. Do you have a link to look what’s the problem? I LOVE your JQUERY TIMELINR!!! But i am not technical. Can you help me to add the timeline to my WordPress website? hey Mark, I remember someone wrote a WP plugin above this jQuery plugin, I never used and I don’t know if it is still available. But you can try it yourself. My recommendation is to integrate it handcoded as I show in this same post. How can I link to a particular time on the timeline with a link from an external HTML page? Matt: that’s not a built-in feature. You’ll have to code that yourself. Maybe listening to certain hash/uri parameter and setting startAt: to that value. Hola, me encanta este timeliner, excelente diseño. Una sugerencia, sería genial que incluyeran un vídeo tutorial de cómo instalarlo. how to initialize two object like a time line on the same page? Its a nice plugin i have seen for timeline. But I am facing issues while rendering dynamic date. it is having browser issue and selection of no of #dates and #issues or you can say it not working for dynamic data(new records are there in html but not visible in browser. it is sliding for static content beyond it will stop.). Please help me on this issue. Typo problem…………..1)browser issue in rendering no of records(dynamic) 2) beyond static records, Slider is not working for both #dates and #issues dynamic records. Hey Feijo, I haven’t figured out why inspecting your URL, I see you define a overflow-y: scroll;. Anyways, try to add another wrapper inside <li></li> and add scroll to that one, not the <li> itself. I have a really long horizontal timeline, I tried adding a wrapper inside the li like you suggested but it messed up the rest of the css. Is there any way to scroll verticaly, or just get to the end or middle somehow? Elen: if you can share an URL maybe I can help you. You shouldn’t have problem, maybe it’s just CSS. Hello how can i embedd this plug in into my wesbite in a seperate div? 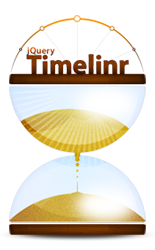 Hi, Your timeline looks awesome, thats why I have installed the module your timelinr. But I can’t see it in my contentype, why? Hernán: hay un branch “multiple-timelines” en el repositorio de GitHub que estaba trabajando en ello, según veo funciona bien. No hice tests extensivos. Puedes probar con ese, dando clases a los timelines en vez de id. Avísame como te va porfavor. Please Tell Me How To Its Responsive? ?